I’m never going to perfect the art of speaking. And hey, neither are you. None of us hairless monkeys are. Granted, Tony Robbins, Eckhart Tolle, Jim Rohn and other well-known speakers are masters, but even they make mistakes. Just because I can’t perfect it doesn’t mean I’m not going to try. Hey! Take a look at The Conversation Handbook if you’ve got a chance! This blog post is still excellent, but if you’re looking for more, that book is 150 pages long and is quite a bit more polished than this article. Good luck! There’s nothing like being able to make my sister smile with some stupid joke. My friends deserve the living, engaging stories I tell them now rather than the dry monotone that I remember having. It’s exciting that I can make new friends just by chatting them up in the minute it takes the elevator to get to my floor. Start by fixing mistakes you’re making. For me, fixing just two of these mistakes accounted for an 80% improvement in my conversational skills. I realize how silly that sounds–how do I know it was 80%? Why not 81%?–but when you go through the exercises a couple of times and focus on fixing these mistakes, you leave me a comment or send me an email and tell me what improvements you saw. I’m not hiding the most important mistakes; they’re the first two steps. On top of working on those mistakes, I built specific speaking skills. These are humour, story telling, volume, gestures, pace, mastery topics and more. These skills aren’t the whole of speaking–a great gesture doesn’t a great speaker make, but a tap on the nose makes a story cuter, and wide arms a statement grander. This is where great conversationalists differentiate themselves: some love deep, highly emotional conversations controlled by pace, mastery topics and story telling; some play subtle games of humour, making their friends feel like everything is an inside joke they’re included in; some make their friends feel like great conversationalists by leading conversations to the most interesting bits, punctuating points properly with volume, gestures and physicality and then backing off. TODAY I’d like to go over how to improve speaking skills with exercises, behaviours and the daily grind. Below are 7 simple steps that I hope will benefit you greatly. I was messing around with photoshop and came out with the JPEG below (How To Improve Speaking Skills in 7 Simple Steps) because why not. There are also useful videos and I vow to answer all questions in the comments. Speaking Loudly and Calling Attention To Yourself. As I’m writing this I’m remembering being a lame high school student. Standing at the edge of a circle of friends-by-inheritance and chiming in once every two days. Guess how I felt when the pretty girls would walk by and their eyes wouldn’t slide over me–they didn’t even look in my direction. I’m also looking at a picture of a beautiful girl who chased me down at a party months ago and made me stay up late and tell her stories until the sun popped up over the windowsill. That wouldn’t have happened if I hadn’t changed something. Something big. Clarity isn’t the whole picture but this is a start. In summary, speak clearly. Enunciate and choose a volume as if it were on purpose. Select the easiest words to get your point across. Only once you’ve mastered clarity should you begin to braid some silvery strands into your language. I’ll give you a topic and the moment you see it you’re going to speak for about 20 seconds. I don’t care what you say. Once you’ve finished, you’re going to think about what you just said, and express it more clearly. Then, you’re going to do it one more time. The third time’s the charm. Remember to start this challenge right away. Imagine a river. The water is moving; it runs around rocks and over the ground beneath it. It’s disturbed by the legs of a bridge. To you, though, it looks smooth. I doubt that the river learned how to flow, but that doesn’t mean that you can’t. With flow we’re aiming at a level of comfort with speaking that lets you approach all topics with equal grace. Unless you’re James Malinchak or Les Brown, you speak too quickly. A mentor told me that I spoke too quickly because I was worried that someone else might speak over me–maybe that’s accurate for you as well. In any case, it is a truism that we.. should slow.. our pace.. down. We also need to be comfortable pausing. If I had only thirty seconds of your time to help you improve your speaking skills, I would tell you to replace all of your filler words with a two second pause. A filler word is “uh” or “um,” or anything you say that is equivalent. For example I like the word “like” but I shouldn’t. Notice whenever you use a filler word, pause for two seconds, and then continue. For this challenge you’ll need a timer and a source for topics. Try using these topics, or some other random topic generator. Your challenge is to look at a word and speak about it for at least 60 seconds, focusing on your pace and pausing while you speak. You can tell relevant stories, relate it to your summer vacation, whatever works for you. If 60 seconds is too easy, try two minutes or more. If you can’t stop using filler words, restart every time you use one. Let’s start by choosing Mastery Topics. Mastery Topics are subjects that you’re interested in and passionate about. When you discuss these topics you naturally exude more confidence and excitement, and you’re more likely to draw listeners into your world. And, since you’ll be talking about your mastery topics so much, you’ll have all of the speaking nuances of the topics covered as well. I’m passionate about living abroad, running a social skills business, general success, learning and food. And if I can I’ll pull our conversation over intto one of those topics and blow you away. What do you most often spend your money on? What do you spend most of your free time on? If you could do anything without a chance of failure, what would it be? Without worrying about money, time or skill, what is your dream-vacation? My answers were: Success, Food, Learning, Running a Social Skills Business, Living Abroad. First we’ll sort them. Ask yourself, what is more generally interesting, Topic 1 or Topic 2? If Topic 1 is more interesting, ask yourself if Topic 1 is more generally interesting than Topic 3. Once you’re at the bottom of the list, add the most interesting topic to the new list. My ordered list is: Living Abroad, Running a Business, Success, Learning, and Food. You should think that you can make the first topic on the list the most generally interesting. If so, let’s work on that Mastery Topic first. So you want to be a topic master? No? Well, make it your temporary day-dream. Take a second to think about your everyday conversations. Generally you fall into a topic that you’re comfortable with and your conversations follow similar paths. The why is fairly simple: we’re programmed to pursue pleasure–the same positive reactions to the same topics and jokes–and avoid pain–the potential shame of expressing an opinion that makes everyone around you uncomfortable. There’s nothing wrong with this, but if we naturally do it all of the time we might as well do it on purpose. To add some flair to our speaking skills we’ll need to add some sub-topics to our Mastery Topic. With these sub-topics we can practice our clarity, flow and style. You’ve selected a Mastery Topic and now you’re going to flesh it out. Ask yourself, “What’s interesting about THIS,” where THIS is your Mastery Topic. Keep going until you can’t think of any more, and then add one or two anyway. Droning on in a monotone will never be interesting, no matter the quality of the content coming out of your mouth. The trick is to express those same words in a more appealing manner. To do this, I suggest you emulate somewhere better than yourself. 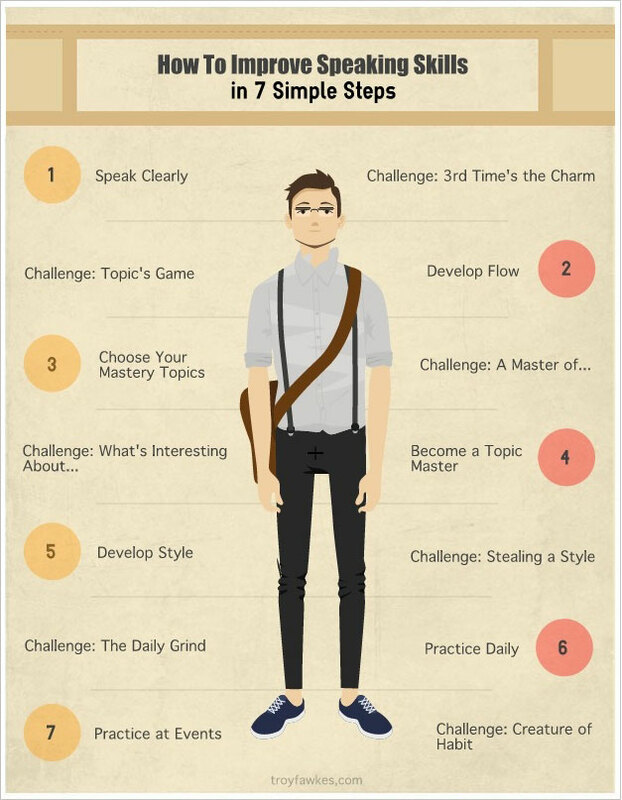 With all of those skills, you use them to emphasize the words that you’re speaking. Sometimes they replace words. Instead of going on about these skills, let’s go over the challenge. Choose one of these skills: volume, pace, gestures, humour and story-telling. Now choose a professional speaker, someone you’d like to emulate and watch a video of them speaking. Ask yourself, how do they use this skill? What one aspect of the skill could I steal for myself? Write it down and keep the video. Be honest with yourself when you answer this question: do you think that you’re going to have improved speaking skills when you finish reading this post? I don’t write that well. But while reading won’t improve your speaking skills, behaviour will. The next section will cover events. Practicing daily is fairly simple. Every day, put aside some time to go over one of the exercises from this post. If that sounds too hard–and I understand that committing to anything is often challenging–ask yourself whether 5 minutes a day for 15 days is too much. If it is, then something else is on your mind and you need to handle that. If not, I put together the option of receiving a challenge a day for fifteen days. The challenges are short enough that you can complete them in 5 minutes or less. Weight Watchers has been using the buddy system technique for years. The act of losing weight is motivational, but losing weight and being celebrated for it is far more exciting. Not to mention having people to hold you accountable when you have a bad week. Where were you? Watching the game? Canada’s Next Top Lumberjack? Come on, this is important. Attend an event that will let you focus on your conversational skills on a weekly basis. There are many events that you could attend, though my favourites are Toastmasters and professional networking events that you can easily find on Meetup.com. Personally I attend meetup groups on a fairly regular basis and I have other social events that I use for the same purpose. The trick is to keep a short list of specific skills that you’d like to practice while you’re there. I will use a broad gesture to create interest. I will try speaking much slower than I’m used to. I will will talk about my best Mastery Topic. Find at least one speaking or networking event that you can attend for the next four weeks and put it in your schedule. You can worry later about whether or not you’ll go. I’ve told you to speak clearly and develop flow. I’ve introduced you to Mastery Topics and what they can do for you. I’ve asked you to emulate some pretty awesome public speakers. I’ve suggested that you practice, practice, practice and I’ve given you some great resources to do just that. If you’ve had some other insights on how to improve speaking skills I’d love to see them in the comments below. Please share what worked for you and what you’re currently trying out!